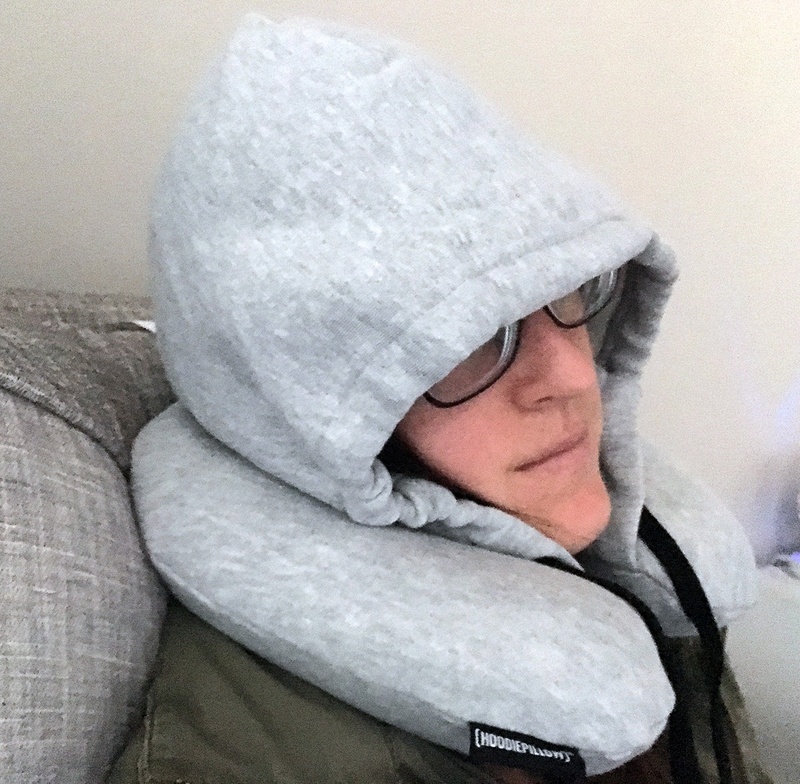 The HoodiePillow’s unique design with its oversized and comfortable hood may make for some great plane selfie, but for me it fell a bit short of being a usable travel pillow. Read on for my full review. The Memory Foam Travel HoodiePillow is made by HoodiePillow. 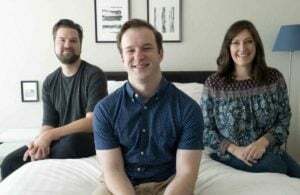 The name may ring a bell if you’re a fan of ABC’s The Shark Tank, as the brand was featured on the show in Season 4 (Episode 415 in case you’d like to watch). HoodiePillow makes a wide range of products from hooded pillowcases for adults and kids to hooded beach towels. 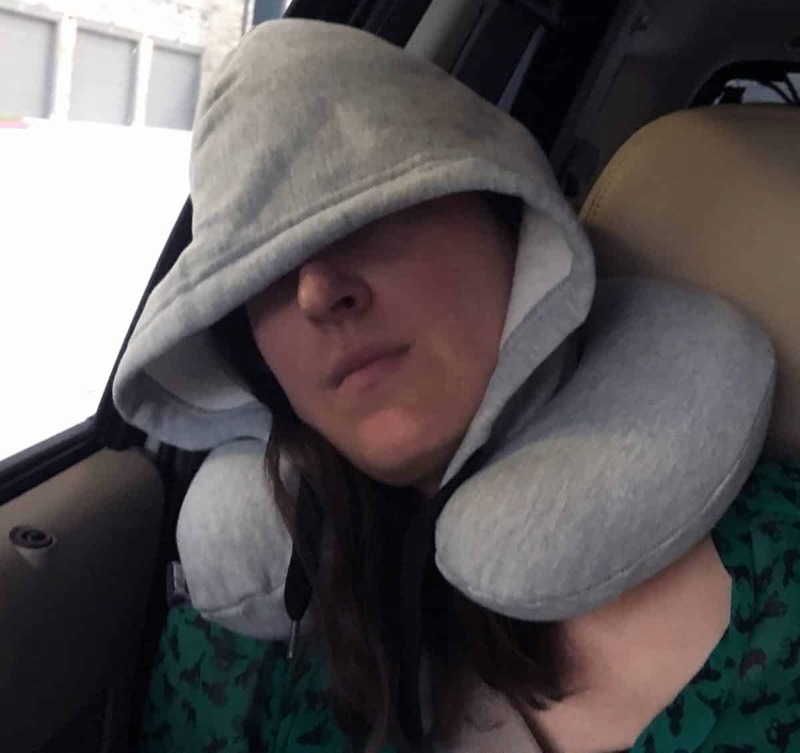 See how the HoodiePillow compares in my best reviewed travel pillows roundup. Upon first glance, this pillow appears to combine two of my favorite things: a comfortable neck pillow and a big oversized hood (that belongs on a sweatshirt) with drawstrings that lets me block out the rest of the world and take a nap. The problem is, the minute I put on the hood and place the pillow around my neck, I felt really self-conscious (although not as much as with the Ostrich pillow). Everyone in the photos on HoodiePillow’s website look very on-trend, serious and cool. They have great hair, the lighting is good and they look like it’s totally normal to be wearing a hood but no accompanying sweatshirt. Unfortunately, it is just not a look that I can pull off in real life (or ever). That and the lack of good support or thoughtful details in the pillow’s design made this an overall bad fit for me. 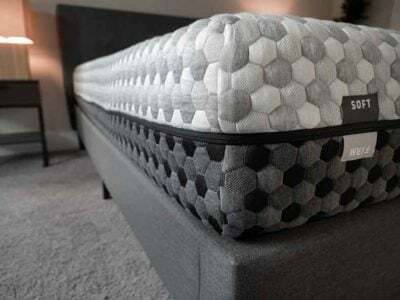 Although it’s made out of a material that seems machine washable, the pillow can only be spot cleaned and line dried, according to care instructions. The cover and the hood are not removable. Between that and the “spot clean only” cleaning instructions, I’m not sure how to fully sanitize this pillow after its been on a plane or train. I wish I could just take off the cover and toss it in the washing machine. 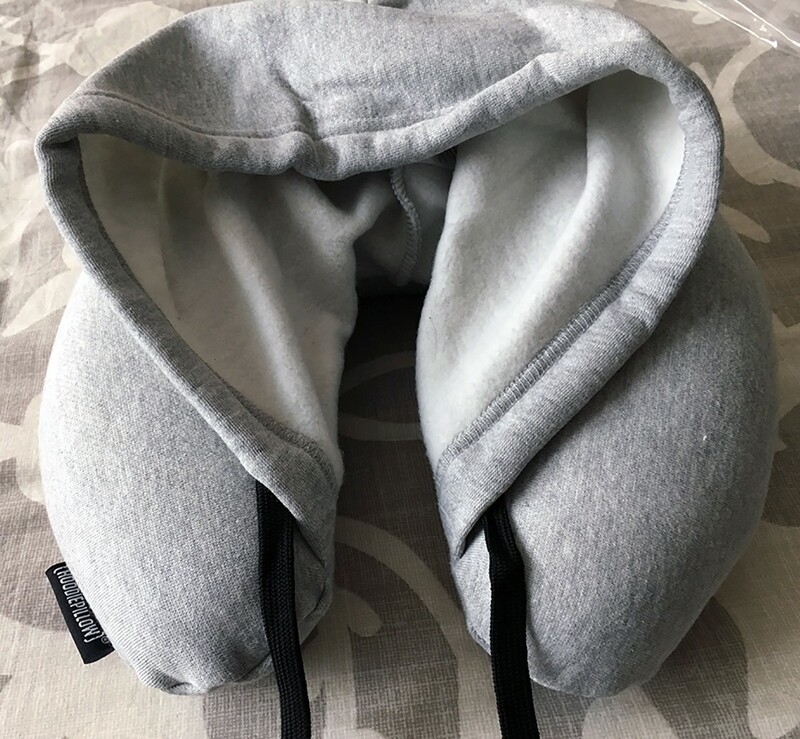 The memory foam in the HoodiePillow is one solid piece and the back portion pushed my neck forward when I use the pillow in a high-backed chair. 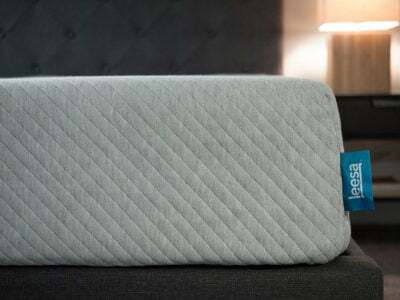 Travelmate’s memory foam travel pillow combated this with a removable foam section in the back that allows you to lean your head straight back. 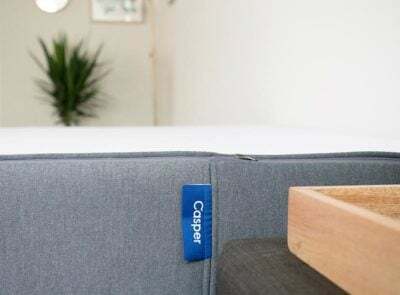 There are no loops to connect the pillow to a carry-on and although it is made of memory foam and you can compact it into a smaller size, it does not come with any sort of travel case (like the Evolution Pillow) to make it smaller to fit into a travel bag. This makes it more difficult to bring with me. When I had my hair pulled back into a high ponytail the hoodie wasn’t large enough to cover my forehead or my eyes (sorry to all those with man buns as well). I wasn’t able to comfortably rest anywhere with this pillow. The memory foam pushed my head forward in my high backed chair and there wasn’t enough foam in in the pillow to support my neck when I leaned my head against the car window. The hood portion of the pillow does come with two drawstrings that allow you to cinch the hoodie around your face and adjust to your comfort level. I thought this travel pillow fell short in many ways. The cover isn't removable, washable or dryable. There is no way to connect it to luggage or compact it to fit into a bag. 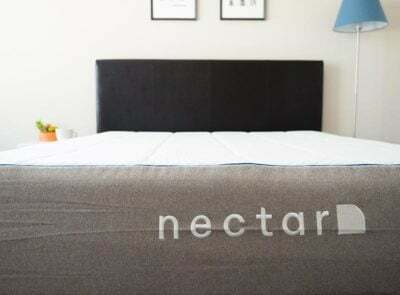 The memory foam filling was too weak to support my neck for side sleeping, but the back of the pillow pushed my head forward so I couldn't sleep leaning back either. The hood of the pillow is awkward and I couldn't get the hood to fall over my eyes and block the light or add additional privacy when I had my hair in a high ponytail or bun. The fabric is soft and it feels like a high quality but besides that and it's ability to make for a fun selfie that's all I liked about the pillow. There are several important factors to take into consideration before buying this pillow. 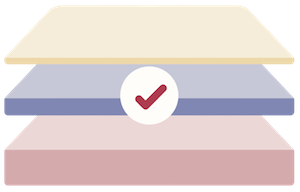 It does not have a removable cover and is not machine wash or dryer-friendly. There is no way to connect it to a carry-on or compact it to throw in a bag, so it must be packed at its current size. Although the hood is oversized it may not fit well when hair is pulled back into a high ponytail. 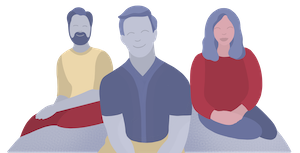 The memory foam pushes my head and neck forward when I use it in a high-backed chair. The memory foam does not support my neck enough to sleep with my head to the side. 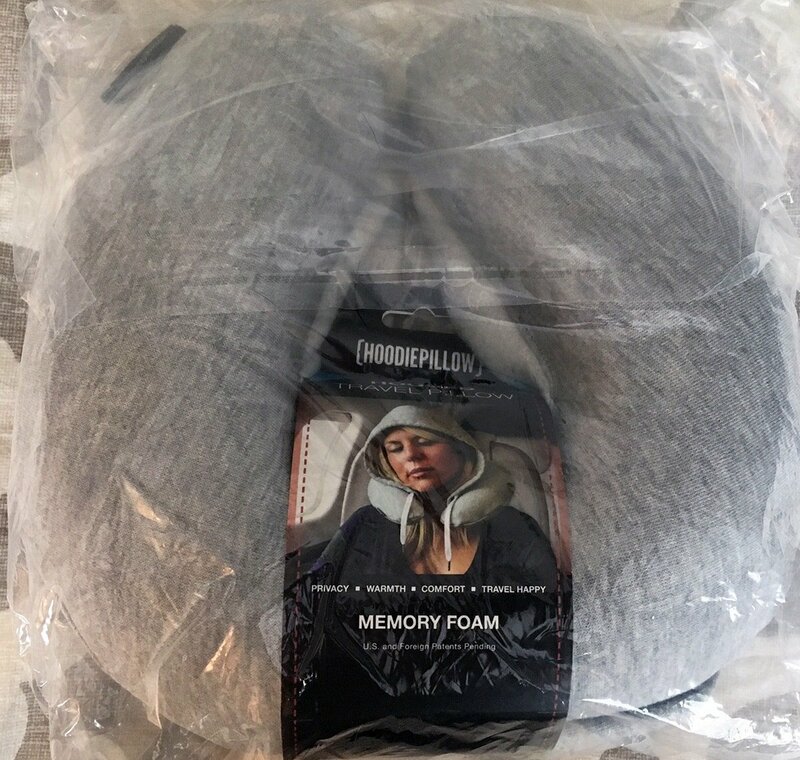 The Memory Foam Travel HoodiePillow costs $29.95 on the HoodiePilow website. I also saw it on Amazon with prices ranging from $19.99 to $34.95. The inflatable version of their travel pillow costs slightly less, which makes sense. 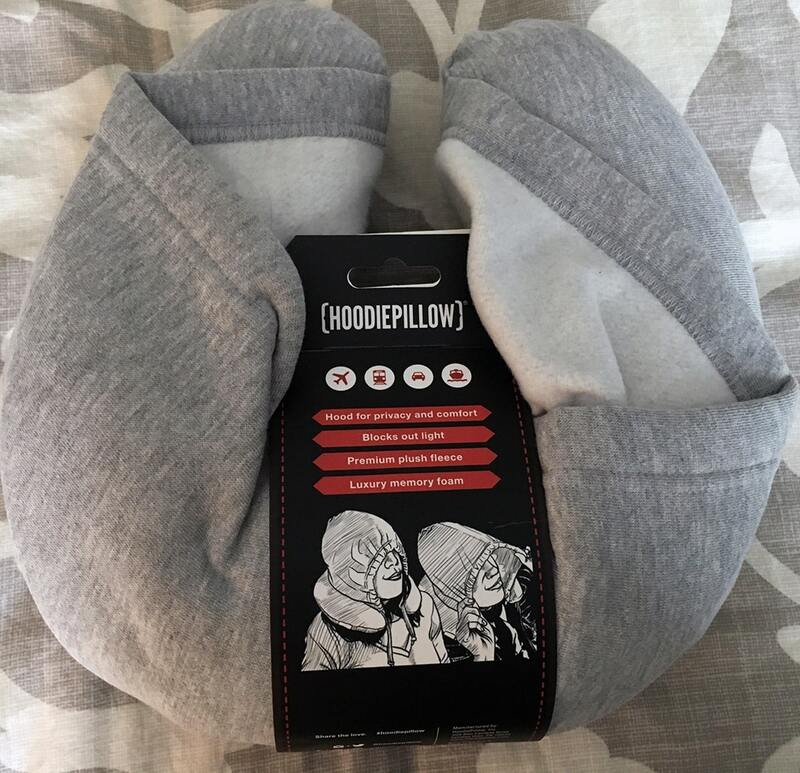 I would also be interested in trying HoodiePillow’s inflatable travel pillow because at least I can easily put that in my carry-on and I could control the level of firmness in the pillow.